MSF plans to support a team of six psychologists who will treat survivors of the devastating earthquake and tsunami that hit north-east Japan on 11th March. A 12-person MSF team has been treating patients with chronic diseases in one of the area's worst affected by the disasters for the last 12 days, and earlier this week sent a psychologist to evaluate mental health needs. “Many people now are in a phase of acute stress disorder, which is a totally natural response to this level of trauma,” said Ritsuko Nishimae, a clinical psychologist working with the MSF team in Minami Sanriku. “If they are not able to get proper support psychologically, there is an increased possibility that they could develop Post Traumatic Stress Disorder,” said the psychologist. Ritsuko has been working in the field for the last two days, getting an accurate picture of needs, as well as working with disaster survivors. “I talk with them and listen to their experiences, and what they need now. Gradually, they open up their feelings and express their thoughts and show emotion. This process is very effective to release stress,” said Ritsuko. The psychologists with whom MSF plans to work come from the Japanese Society of Certified Clinical Psychologists and MSF will assist them in identifying populations in need of assistance, as well as providing logistical support. MSF medical teams continue to work in evacuation centres in Minami Sanriku, in northern Miyagi prefecture, and have also started supporting a Japanese doctor who was working in the town of Taro, in Iwate prefecture. The main activity continues to be consultations with elderly patients suffering from chronic diseases such as hypertension or diabetes. On Wednesday 23rd, MSF distributed 10,000 hygiene kits comprising soap, tooth brushes, toothpaste and towels to evacuees in Minami Sanriku. On Friday and Saturday, non food item kits containing batteries, candles, matches and towels will be distributed to 4,000 people. Daily improvements in the provision of food, water and electricity are seen by the team. 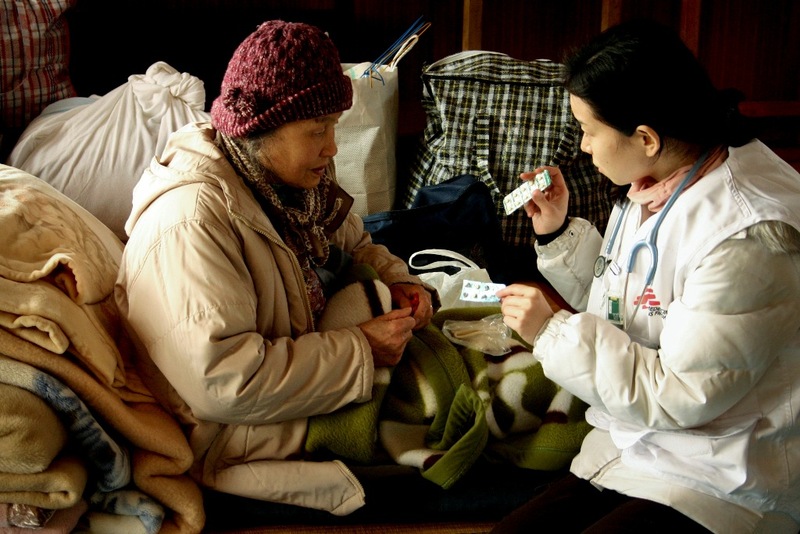 The emergency phase of the national response to the disaster appears to be winding down, as Japanese DMAT (Disaster Medical Assistance Teams) withdraw, and local authorities gradually take over responsibility for medical care. We will continue our current medical activities in coordination with local authorities, and monitor the situation specifically in remote areas where we can provide additional support if needed. The national response by both the government and non-government agencies remains huge and continues to expand it's reach, but the MSF team will remain on the ground to fill in gaps in treatment of patients or other needs should they arise.